The year was 1978 and I had just started a new job. It wasn't long before a co-worker, Dorothy Kulp, took notice that a riding jacket and helmet accompanied me to work every morning. A few more weeks go by and she tells me that there is someone I think you should meet. She escorts me to the far end of the machine shop where a very intent and determined looking fellow was operating Bridgeport and Cincinnati milling machines. I could tell by his demeanor that he was all business. Dorothy introduces me to Karl Duffner and tells me he is also a rider and has quite a collection of motorbikes. Well, Karl and I talked quite a bit that day about our riding experiences. I thought I was a rider until I listened to some of his riding adventures. I have lots of interests and hobbies, but riding motorbikes is what really makes my gears spin; I was all ears. Karl's stories really peaked my interest and I quickly realized how passionate he was when it comes to motorbikes. I was fascinated with his knowledge, experience and enthusiasm for the sport. As he was operating his milling machines, we chatted right up to the end of his shift. Karl cleaned up and punched his time card. I followed him out the rear door to the parking lot and starring me in the face was this stunning silver smoke 1974 BMW R90S with lots of bells and whistles. I had never seen anything like it before. The single dominating focal area was the 13 gallon Heinrich fuel tank. It was massive and I couldn't take my eyes off of it! Karl likes to personalize his motorbikes with aftermarket accessories, rare factory options or parts he machined himself. When it came to his bikes, he spared no expense whatsoever! This is why he worked a second machinist job for a good portion of his life. If there was something he wanted for his bikes, he just bought it, no debating. I soon found myself escaping from my desk job and migrating to the machine shop on a daily basis. We quickly connected with one another and became very good friends, I couldn't wait for a chance to get together and do some riding with Karl. It wasn't long before that opportunity came to be. Karl invited me to join him and a couple of friends to the BMW rally in Cass, WV during the Memorial Day weekend. I told him I didn't own a BMW. He said not to worry, just ride what you have. Now up until this time, my previous riding experiences were limited to a hundred mile radius, mostly afternoon rides trying to get lost on scenic country roads. This was all about to change quickly. Karl became my mentor and taught me the ropes of long distant sport touring. He broadened my horizons and opened up a new world for me. 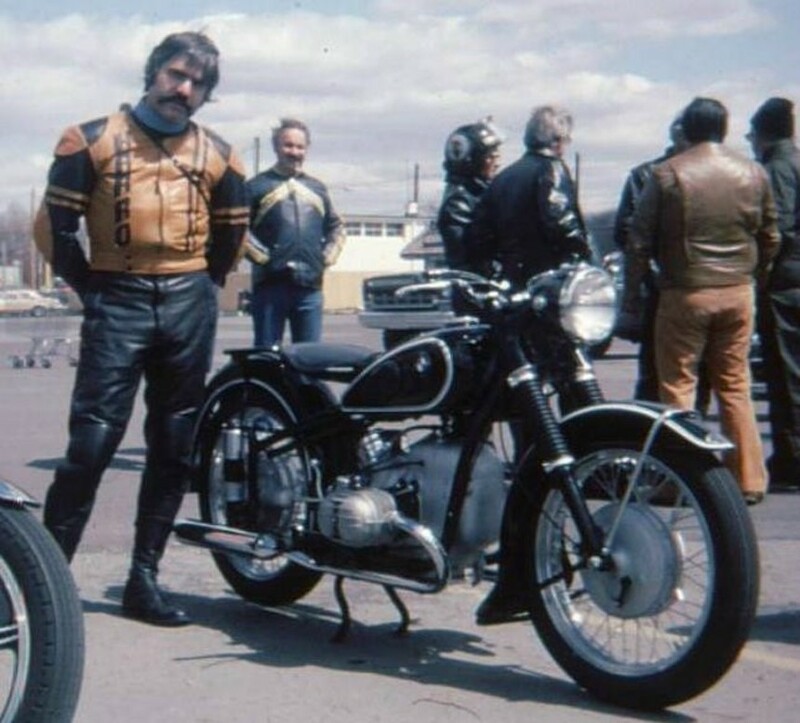 With his advice, I soon acquired a 1979 BMW R100S and fell in love with that machine which I still own today. What an improvement over the bikes I had been riding the past ten years. That trip to Cass, WV made me a believer in the Bavarian opposed twins and I was hooked forever. To this day, I can still remember the thrill and emotions following Karl as we carved our way through the switchbacks on those mountain passes on Route 250. I could not get enough of those twisties. My heart was pounding as the bike tossed right to left and left to right, my knees nearly touching the asphalt on every hairpin turn. It was an experience never felt before and one I will never forget. What I liked about the rally was the camaraderie of like minded folks who really enjoyed riding and sharing their experiences with friends and fellow riders. Karl could tell a pretty good story and he had many riding adventures which supplied him with an endless amount of material. When Karl spoke, people listened to what he had to say. Little did I know at the time, I was being taken under the wing of one of the most talented, experienced and passionate riders this area has ever known. Karl had already reached legendary status in some circles. Being 12 years my senior, he had already clocked a couple hundred thousand miles on a superb collection of bikes. Plus, he made three separate trips to the Isle of Man, transporting his '62 Sportster on the Queen Mary and the Queen Elizabeth. He was fortunate enough to spend a week hanging out with Mike "The Bike" Hailwood and his crew on one occasion. In later years he stored the '62 Sportster with friends in Germany. So every summer, he would try to spent two or three weeks touring Bavaria, Black Forest and Tyrolean regions. One year, Karl asked me to join him on a trip to Europe to enjoy Oktoberfest. I didn't realize this at the time, but each village or region celebrates Oktoberfest on a different week. We decided to help the Munchen's celebrate;...that was a good time!! Karl became my guide as we toured all through the Bavarian Alpine region. We visited auto and motorrad museums, the Harro Leather facility, took a cable car to the top of Zugspitze (Germany's highest mountain), rode Grossglockner Hochalpenstrasse (High Alpine Road) on our way to Italy. On our way to Switzerland we rode up The Stelvio Pass otherwise known as Passo dello Stelvio or as the Germans call it, Stilfser Joch. Some have named it the world's greatest roadway as it requires you to navigate 48 challenging switchback turns to reach the mountain peak. We spent the next day wondering around and visiting the village of Zermatt; now that's an alpine village if I ever saw one! I got to meet some of Karl's old friends and we went to a Pforzheim motorrad club meeting at one of the local watering holes. Another highlight of this trip was that I actually got to meet Karl Heinrich at his home. Heinrich is famous for designing and manufacturing the custom large touring tanks for the air-cooled BMW's and other brands. At one time Karl was importing quite a few of these fuel tanks for himself and friends, so he got to know Heinrich pretty well. Karl had to grow up fast due to witnessing the harsh reality of WWII first hand. His heavily industrial city of Pforzheim was the victim of aerial bombing on a nightly basis due to the many important strategical targets. Karl vividly recalled a German train hit by an aerial bomb sending the whole train off its tracks and on its side, wheels spinning and spinning but going nowhere. The allies didn't relent until the city was reduced to rubble. Thankfully, his family survived the pounding. His interest in WWII and the aircraft of that era remained strong his whole life. When riding I would often catch Karl looking up to the sky to spot a vintage aircraft. Karl's father served in the German Army and was fortunate enough to be stationed far enough from the front lines. After the war, there wasn't much hope or promise, so the family emigrated to the United States where the future looked brighter. Karl was just a young teenager and had to readjust to a new country, friends and language. After high school, Karl enrolled in a trade school to become a machinist. This trade served Karl well and kept him fully employed for more than 40 years and allowed him to earn a pretty good living. His skills were in high demand by various employers and fellow riders and restorers. 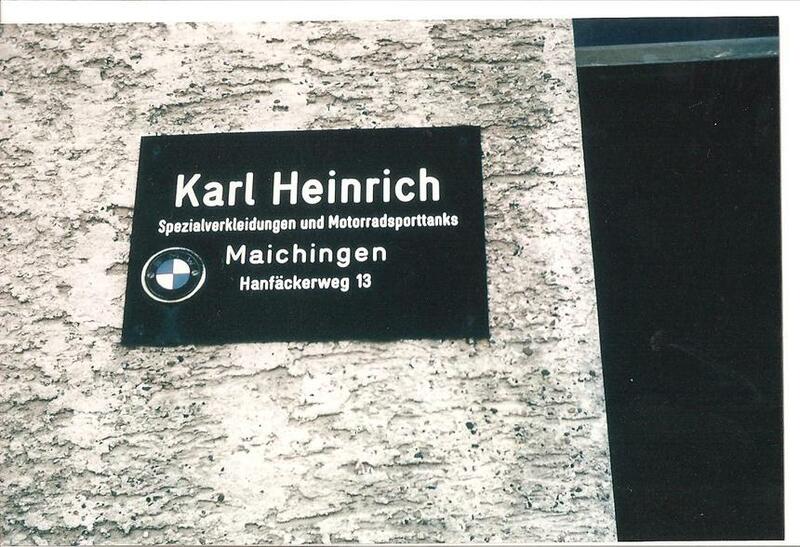 Karl told me when he spotted his first motorbike as a young boy walking the streets of Pforzheim, Germany; he instantly knew that someday he would have to have one of his own. This wish came true at the age of 15 and living in the United States, he purchased a Schwinn Whizzer. That was just enough to wet his appetite. The next year he wasted no time and was ready to move right up to a 1000cc Ariel Square Four. His father didn't seem to mind as long as Karl kept up on the insurance. 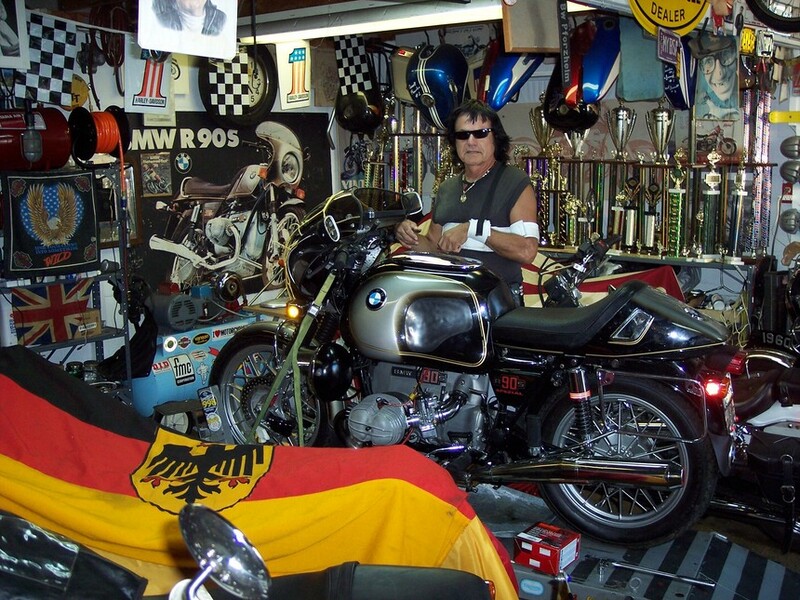 As the years went by, Karl would buy a '54 BMW R68 from his friend's father, then a '60 BSA Gold Star DBD34, '51 BMW R51/3, '62 HD XLCH, '70 BMW R75/5, '74 BMW R90S, '59 HD FL DUO GLIDE and a couple brand X models for parts runners and lady friends. Every year Karl would go through his calendar and circle the dates of the major cycling events. He was determined not to miss anyone of them, come hell or high water. High on his list were: Daytona Bike Week, Laconia Bike Week and The Finger Lakes, NY, BMW Rally. He rarely missed any of those. 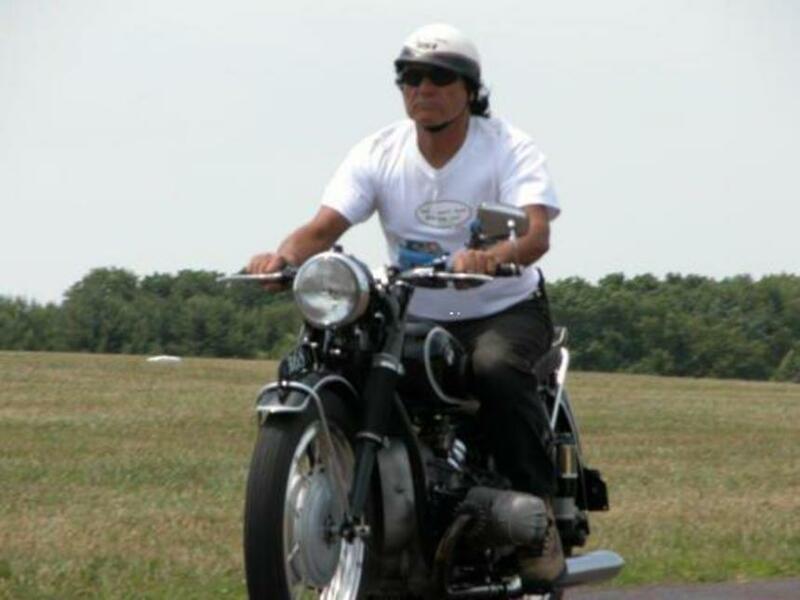 Next level of priority were Cass, WV BMW Rally, Dutch Country Rally, BMW MOA and RA Rallies, Mid-Ohio Vintage Days, several BSA/Triumph/Norton meets/shows, Germantown, MD Vintage event and becoming one of our favorites was the Barber Vintage Fest, in Birmingham, AL. Sandwiched between these major events were: swap meets, shows, breakfast rides, Dirt track races at the Syracuse Mile, Ice racing on Saratoga Lake, Woodstock Vintage Rides, trips to Nova Scotia and Newfoundland and various club events and poker runs. The first event of the year and the biggest for Karl was of course Daytona Bike Week. In fifty-two years I believe he may have missed this event three times. Karl did not want to squander five vacation days all at once, so early in the year. Many times we would ride down to Daytona for the weekend. Now, keep in mind we live in Pennsylvania, Daytona is roughly a thousand miles away and it takes place during our winter. His plan was for me to meet him at his house at 5 am on the last Friday of Bike Week. We would ride all day Friday and find a lodge as close to Daytona as we could, then spend Saturday in Daytona trying to see all there was to see, ;.ride the beach, walk up and down Main street, ride over to the track and try to catch some racing, then maybe attend the vintage auction in DeLand. Sunday morning we rose bright and early for the return trip and would be back home that night. This went on for years. One year, snow was forecasted and sure enough as I arrived at his door at 5 am on Friday, it started to snow and it was coming down at a pretty good clip. I thought, well this is it, time for me to go back home. NO;instead Karl says "Let's fire up the bikes and get rolling". We scrambled to Interstate 95 as quickly as we could. Then at least we could follow the path of the tire tracks that the big rigs were kind enough to lay down for us. The snow finally subsided in central Virginia so we stopped for breakfast. This was short-lived, as we were finishing our meal the snow caught up to us again, chased us out of our seats and onto our saddles. On another trip to Daytona we got pulled over by one of North Carolina's finest. This really didn't sit too well with Karl, because he always had a radar detector hidden in his "S" fairing on the R90S. Anyone who ever rode with Karl knows he has a heavy wrist; he likes to fly like the wind. Well, Smokey was sitting at one of the on ramps to I95 and nailed us from behind. The officer was an elderly trooper and directed us to sit inside his patrol car while he wrote out the tickets. Karl sat in the back, I sat shotgun. The conversation was cordial and even became comical. He started to tell us we were performing an Evil Knievel maneuver although it came out jumbled and twisted because the officer couldn't remember the dare devil's name, but we figured out what he was trying to say. I downplayed our excessive speeding stating we were just trying to do our best from not getting run over by the big rigs. He must have heard that one before. Later, as he is reading our registrations, he shouts out, "B___M___W", I never knew they made motor scooters. "Since 1923" I replied. He gladly took our credit cards, ran them through his card reader and told us to be careful. A week later Karl installed another radar detector in his seat cowl pointing rearward. I remember one year returning from Daytona, the whole eastern seaboard was under an intense low pressure zone, so we had to ride a thousand miles in a hard downpour. Not too pleasant at the time, but when you reflect on the really warm sunny day that preceded, it wasn't so bad. We got to enjoy a beautiful summer day in the middle of winter! Laconia Bike Week is held in the middle of June. This 10 hour ride was truly a treat and was one of the highlights for the year. We didn't come for the racing so much as we did for the riding and tire kicking with friends. New England has such charm and beauty and an architectural style that is very appealing. On Karl's "things to do" list was the obligatory ride through Franconia Notch to see "The Old Man in the Mountain", if you haven't yet seen this yet, well; it's too late. The Old Man left us. The Auto Road to the top of Mt. Washington was a must. This year they celebrate their 150th Anniversary. You never know what to expect and the weather can be very severe at the top. I remember leaving the base on a 74 degree sunny day only to find it 28 degrees and snowing at the top. You want to pack extra warm clothes for this trip. Returning on the Kancamagus Highway was also a popular route for us. As the weekend wound down to one final night, we had to celebrate with a Sunday dinner at Hart's Turkey Farm Restaurant in Meredith, NH. This meal alone would make the trip worthwhile. 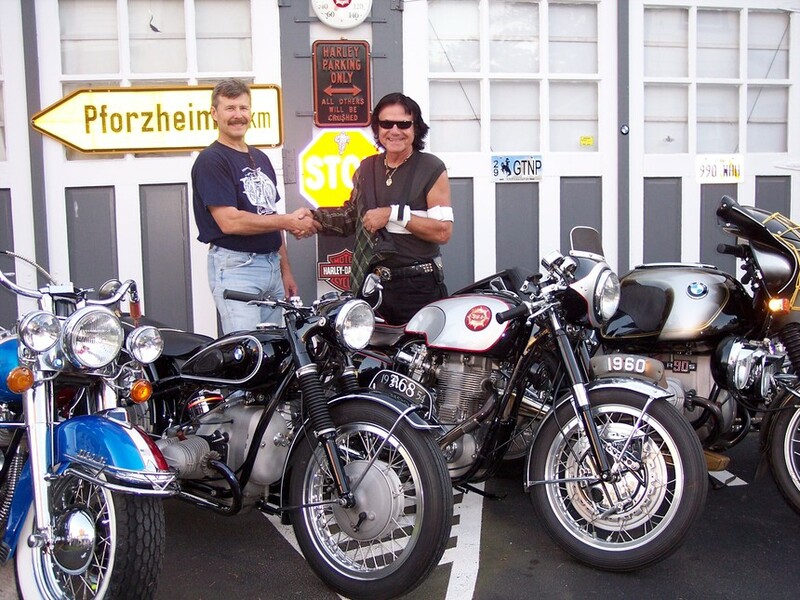 July brings us the BMW MOA rally and Mid-Ohio Vintage Motorbike Days, Karl and I did our best to attend these events. The Finger Lakes Rally in Watkins Glen, NY is held on Labor Day Weekend. This is one fine motoring event which often attracts 1000 or more riders. Karl attended all but two or three of the 35 years that this event was held. This is a great location, with wonderful scenery and something for everyone to enjoy. Karl was so well known there, that he couldn't walk five steps without running into an old friend. Karl loved the ride to Watkins Glen so much, that sometimes on a hot summer day, we would ride the 500 miles round trip just to sample a Teaberry milkshake at the Great Escape Frosty, his favorite flavor, and then return home. Late one year I told Karl that I still had one week of vacation left and I wanted to ride to the Gator Rally in FL, then continue on to visit a friend in San Antonio, TX and then ride on to see other friends in San Luis Obispo, CA before heading back to PA. Karl didn't have that much vacation time left, but he said he would ride to the Gator Rally with me. We left Philadelphia on Friday morning in October and arrived at the rally in central Florida that evening. We enjoyed ourselves Saturday at the rally and on Sunday morning we rose early. I was heading west and Karl was heading north, back home to PA. While fueling our bikes, I couldn't help but notice that Karl filled a one gallon jug in addition to his 13 gallon Heinrich tank. I thought that was strange, when I questioned him, he said he was tired of getting badgered about the need for such an extraordinary large tank. Many riders would mock him saying, he would have to stop two or three times before running THAT tank dry. That day he proved them wrong. Some 600 plus miles later, Karl finally ran the tank and both reserves dry without stopping once. He said he almost passed out and was blue in the face, but he just had to do it one time. 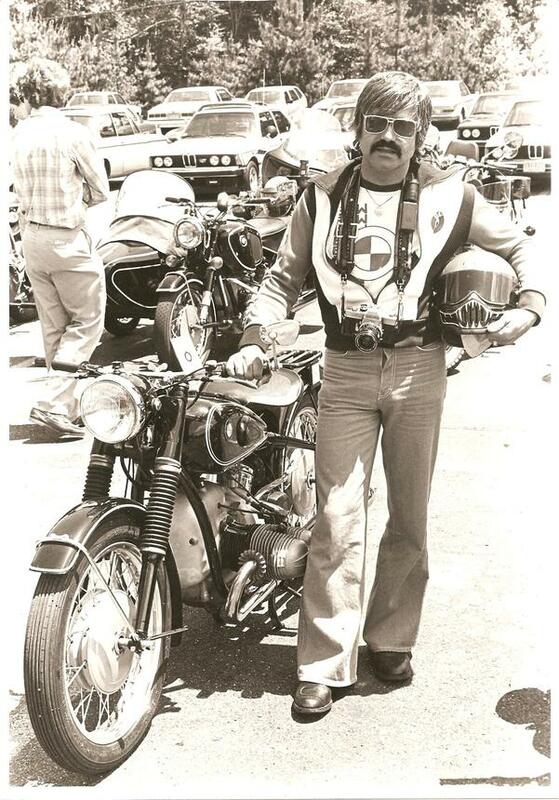 On another occasion, Karl was leading a group of riders returning from a hill climb event in Freemansburg, PA. One of the riders was a young muscular fellow who had just purchased his first bike, a new Sportster. He thought he had riding mastered in only a short couple of weeks. He started to challenge Karl like he was trying to prove something to him. The fellow was hanging right on his rear tire and kept pressing on. This was fine until the road started to twist and wind around up and down. Karl had enough realizing a disaster was in the making, so he quickly accelerated and took off. Not long afterwards, Karl noticed nobody was anywhere in sight. He circled back only to find the new Sportster twelve feet in the air, embedded backwards and upside down into the side of a farmer's barn. The young rider had a couple of busted bones, but he was alright. He learned a valuable lesson that day! Hugo Scholer is a riding friend of ours and on one trip to Newfoundland; Hugo got distracted or was daydreaming and started to lag pretty far behind the rest of the riders. After noticing he had some distance to make up, he decided to really pick up his pace. Hugo must have being doing 80 mph when he flew past the rest of the group who turned into a cafe for lunch. Everyone else had their gloves and helmets off while waiting for Hugo. Like Karl said, when someone flies past you doing 80 mph, you have to do 100 mph if you plan on catching up any time soon. From that point on, Hugo was Karl's shadow, he was never more than two bikes lengths behind after that episode..
By the time Karl passed on Thanksgiving Day 2010, he accumulated nearly 700,000 miles on his wonderful collection of bikes. He gave those bikes a workout, but they always looked showroom fresh. Karl was always ready to lend a hand to a rider in need. He was the best friend and riding partner I could ever have hoped for. He taught me much about riding, wrenching and long distance touring, but he also taught me much about life. Nobody will be able to fill his shoes as Karl was a very unique individual. I miss him dearly and only hope to be reunited someday as we have some unfinished business to take care of. You left us far too soon, but you'll never be forgotten. Rest in peace my good friend. 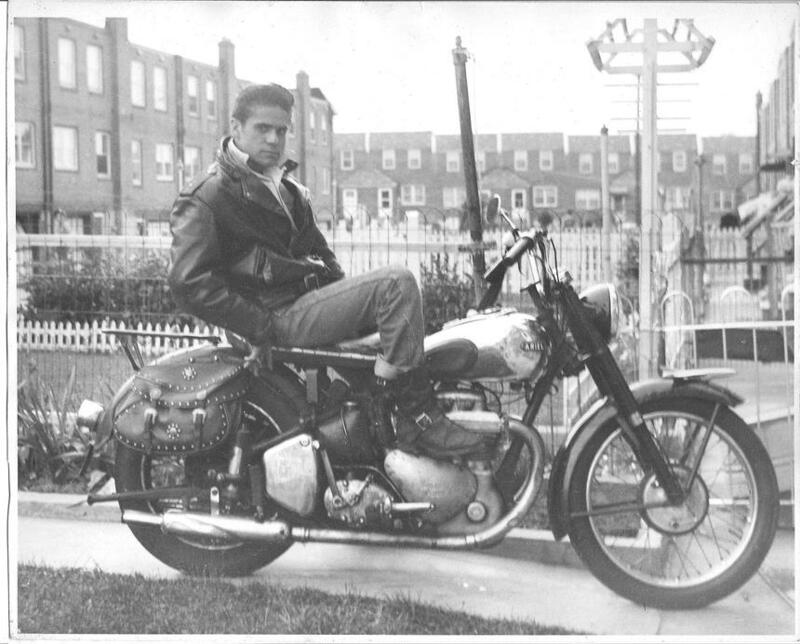 A young Karl with his Ariel Square Four, about 1956. Karl and his R68, looks like the 70's. Karl in his Harro Leathers in 1978 with 1954 R51/3. 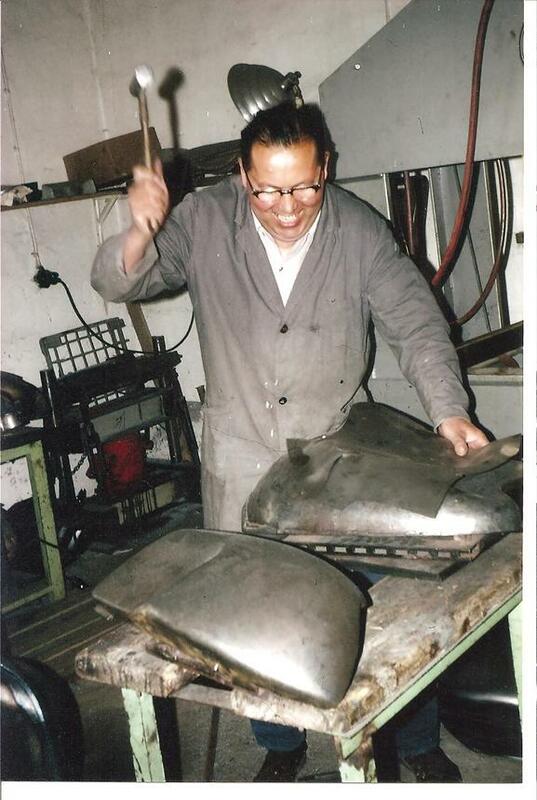 Karl Heinrich banging sheet metal into gas tanks. Karl Duffner and Karl Heinrich. 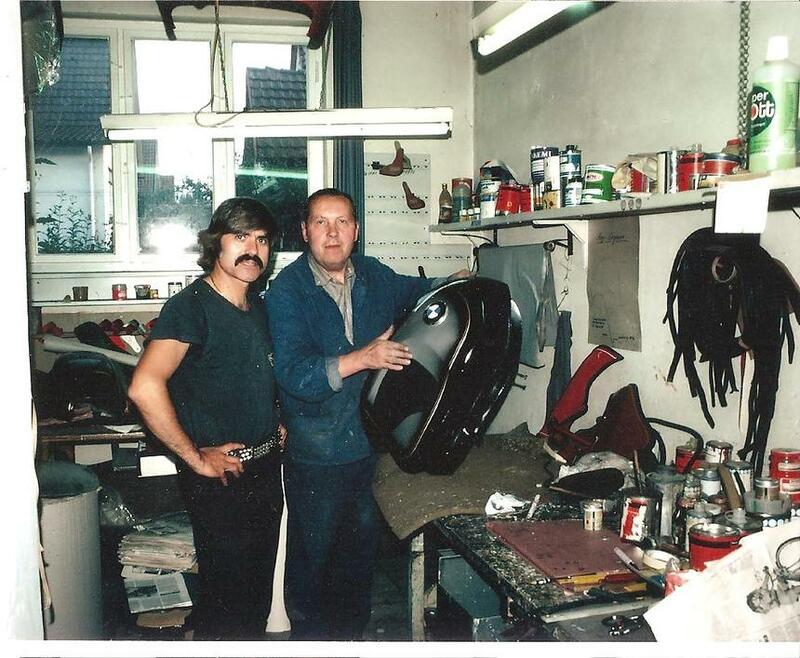 Karl in his shop with his R90s and other treasures.